Tustin (March 31, 2014) – When Intel was given the coveted first slot at the CES 2014 Pre-Conference Keynotes held in the Venetian Hotel Ballroom, Las Vegas, WorldStage was on hand to support Pedersen Media Group (PMG) by enhancing the core AV equipment package provided for all the keynoters and customizing the space to showcase the address by new Intel CEO Brian Krzanich. 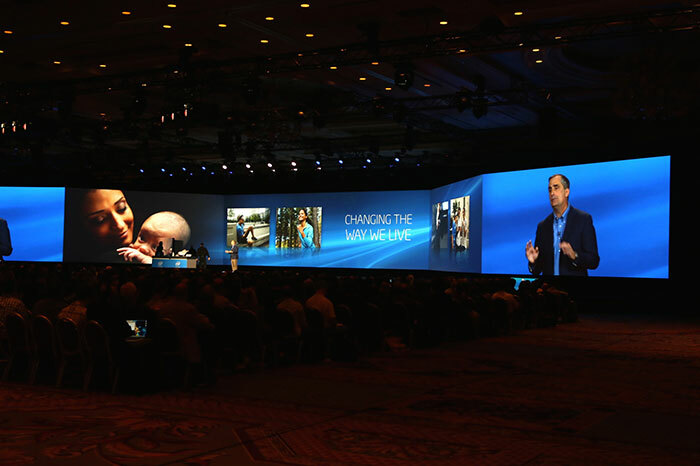 WorldStage has worked with PMG on numerous Intel events in the past, including the Intel Developers Forum (IDF) and Intel’s International Sales & Marketing Conference (ISMC). In addition to the pre-conference keynote at this year’s CES, WorldStage also supported PMG with AV services for the joint McAfee/Intel Security customer experience at Delmonico’s. The primary challenge of the keynote was limited access to the ballroom, which Intel shared with fellow keynoters Sony and Cisco. The ballroom’s core equipment package featured cameras, audio and projection gear that consisted of a widescreen rear projection center display and a pair of rear projection outboard displays. To support Intel’s comprehensive vision of Computing, PMG’s Creative Director, Mark Pedersen, called for “an immersive, widescreen experience across the whole ballroom,” says WorldStage VP of production services and account manager Richard Bevan “So we used the center RP screen that was provided and brought in two FP projection surfaces per side to span the ballroom for seamless video playback, speaker support, demos and IMAG.” The screens were angled to follow the angle of the existing design creating a dynamic and dramatic display that spanned 175 feet. But scheduling logistics required moving those screen panels in and out a number of times before the keynote was delivered. Fabrication partner Communilux was instrumental in ensuring repeatable, consistent installation and line up of the screens each time. WorldStage furnished PMG with a Pandora system for multi-channel playback and a Vista Systems Spyder image processor for the screen switching. Eleven confidence monitors, consisting of thin-bezel NEC monitors, were installed in the keynote ballroom and in the rehearsal space to show the widescreen content, notes and demos. The content featured a lot of “wow moments,” according to Bevan, including a stunning opening video that required a seamless blend of three 5K live action sources and 3D animation. Demoes spotlighted future technologies such as a chip with a miniature Pentium computer with Bluetooth and Wi-Fi that can be embedded in any device or piece of clothing; a wireless charging bowl; a smartwatch with geotracking; and a flying whale that came alive for an amazed audience of 5,000. For the latter Leviathan Project, based on the child’s storybook about a whale airship, PMG created the ultimate immersive storytelling experience with Intel—collaborating with the USC World Building Media Lab. To bring a 60-ton whale to life above the heads of the audience, six HD camera feeds created the basis for the live feed onto which the “smart” 3D animation of the whale was layered. This augmented reality, created by the Intel and USC whizzes, was so seamless in appearance on tablets used by audience members and the web feed that many tried to reach out and touch it. WorldStage provided all the camera equipment to support the experience. At CES WorldStage also partnered with the Taylor Group to support the Intel booth at the Las Vegas Convention Center and with Plumbago for the Intel press event at the Mandalay Bay Hotel. At WorldStage Jack Dussault was project manager, Terry Nakamura projection supervisor, Jason Spencer the Spyder operator, Raul Herrera the Pandora operator and Jeff Gibson video engineer. PMG’s event producer was Rick Voigt. TPN provided the base equipment package for all the keynoters at the Venetian.